Punching bugs in a dark, dark cave. I can feel Darksiders’ spirit in here somewhere, but the level feels empty. There are no platforming sections. There are no treasure chests full of weapons. There is some very light puzzling, involving throwing insects at web barriers. Mostly you just run through some gloomy corridors and squash some giant crabs. I have access to three of Fury’s weapons: the Barbs of Scorn, the Mallet of Scorn, and the Chains of Scorn, and digging into the menu screens here we find some numbers that hint at some depth and progression systems. You can slot ‘Enchantments’, in this case a ‘Demonic Fortifier +1 that adds 6 percent physical and arcane damage, and a five percent health boost. It doesn’t look like weapons and armour will drop as loot. I’d guess Enchantments are the main way to upgrade your weapons, and there is a section of your inventory dedicated to ingredients that a character called ‘Ulthane’ can mould into new weapon boosts. In addition, Fury herself has health, strength and arcane stats that you can increase with attribute points. Personally, I will miss the ongoing visual character changes that loot allows for, but it looks like there will be some numbers to play with, and Darksiders has always leant heavily into the ‘action’ part of action RPG. You fight with a familiar array of light whip attacks and heavy secondary weapon attacks. You dodge with the right-bumper, and if you dodge at just the right moment you can respond with a powerful slam with your weapon of choice. Weapons have powerful abilities that hurt enemies and, in the case of Fury’s purple rock explosion power, be used to traverse the level—one trailer shows fury using the purple rocks to climb a wall of crystal. Sadly, there's no sign of any finishing moves. The environment’s a bit underwhelming too. Darksiders has lots of dungeons, but particularly in the second game, there were outdoor areas too with a sense of scale and adventure. You even got to ride around on your horse of the apocalypse fighting titanic bosses in game two. Most of the screenshots and videos of Darksiders 3 are set in similarly glum cave structures. D2 had its share of derivative areas, but you also got to dangle off a ghost ship pulled by two flying, angry leviathans. There are reasons for hope here. The huge grasshopper boss shown recently has some of that old Darksiders flair. Where is the rest of the personality, though? In all of the marketing materials we’ve seen so far barely a word has been spoken by any characters. We know that the seven deadly sins have overrun Earth, but there’s no sense of context or drive to Fury’s journey in this preview build or really anywhere. Maybe, for a change, that’s all being saved for the November release. 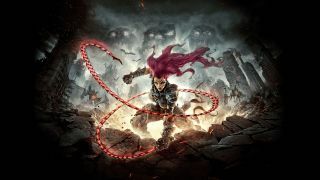 I really want Darksiders 3 to be good, because I've always had a surprisingly good time with the the series, and even ended up heading back into Darksiders 2’s DLC. Still, these few hours have put me back to ‘wait and see’ mode, even though I’m rooting for THQ Nordic to get it right. It's due out on November 27.